I think the makers of this show should be ashamed and banned from making any more series, they have lost the plot midst the PC stalwarts. I think any one who reads this post will know where this is leading. Most certainly the person that this post is aimed at is to quote the phrase "famous for been famous" and precious little else, and sees this gig as more money for nothing, other than been a third rate "celebrity" and as such can't be blamed for taking the money. As I am obese I can cast stones at other obese folk without any malice intended, just as a point of observation. Dancing on ice is what it says on the title, ice dancing. Here is the rub, it requires the female partner to be lifted from the ice at times, twirled round at other, generally been light footed. If you are obese, these things are to be honest out of your reach. As such why do these Producers go down this avenue, I am sure some people will be laughing at the contestant, and not with them. I just feel it's not right somehow, would exploitation be the right word. 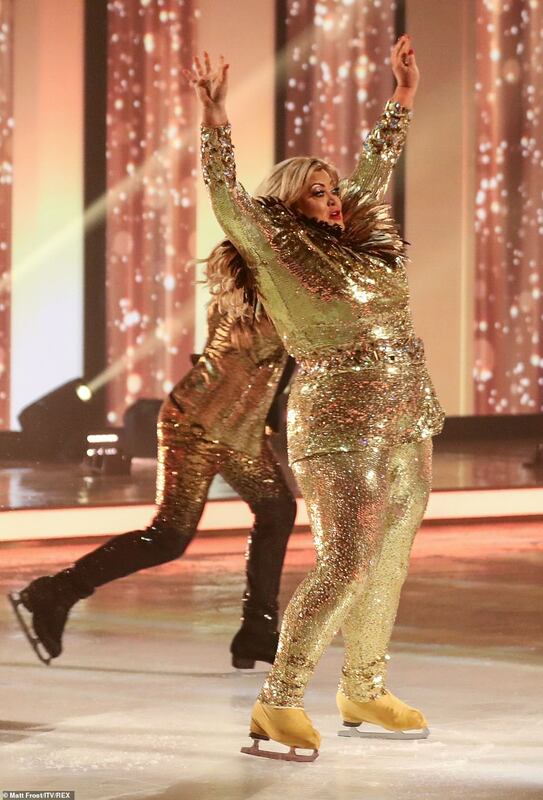 The person in question, Gemma Collins has been subject to a lot of online trolling because of her weight. It seems peculiar to me that as a nation we have never been fatter, yet as soon as someone appears on TV, who isn;t the perfect weight, they are immediately targetted. Apparently, from what I understand, GC is constantly in these celebrity magazines, every argument is magnified a thousand times. She is a nasty vindictive person who who vies for attention anyway she can, she is just a time waster and looks a real fool in this competition. She entered Im a Celeb with a real game plan, this was her plan, air fare paid, show my face in the jungle and then spend three weeks all paid for in a Luxary hotel. Why should it be condemnation of just this show and just weight - all the older celebs/politicians etc on dancing programmes can't lift their partners and professionals couldn't lift Anne Widdicombe. Its entertainment for the masses - i think sitting at home taking the proverbial out of people on these shows is the shows stock in trade. I've never watched any of the "reality" shows but to be honest you don't need to, because it's apparently newsworthy. I think they're only a funny man away from a panto,they've all got a dame ,ugly sisters, a villain and a nice person. I like Skating I used to go regular to Silverblades thats why I like the concept of this show but it really digs up the most annoying dredges in our society. See Collins gobbing off as per. Acused jason what his face for selling stories about her. If he has i bet he got about 10 bob. Why is she complaining about someone keeping her name in the celebrity magazines. It keeps her profile high, which is what she wants. She should get off her fat arse and do a full days work. She might shift some weight then. Well said that Man. No truer word spoken. She obviously has got some followers as she is still in the competition. Can't wait to see her fall flat on the ice but then she would probably crackle it. Its the youngens who are keeping her in . They like the gobbin off. The first time she falls down she will pack it in. I just cant wait for that to happen. I wonder if the results are fixed. Gemma Collins is not well liked by the public, and I would've thought that people would take the opportunity to get her off their screens at the first opportunity.